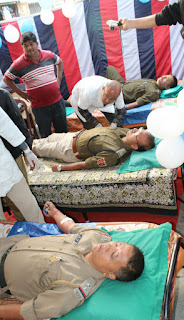 Kalimpong Traffic Police today organised a Free Medical camp and Blood donation Camp today. The Camp was inaugurated by Kalimpong ASP Amlan Ghosh in presence of SDO Kalimpong Nirmalya Gharami , IC Kalimpong D Banerjee, SDMO Ankan Simlandi and others. A total of 3 doctors team from Kalimpong Hospital along with Hospital Blood Bank team, Jamgon Kongtrul Eye Centre were present to check the hundreds of patient who came to attend the camp. A team of Chalak Mahasangh, Indian Redcross Society Kalimpong Branch, Members of Marwadi Yuwa Manch took active part in the Blood Donation Camp. ASP Kalimpong Ghosh who was one of the blood donator said the camp is organized to strengthening the Police Public friendship. He said Police will organized many program to enhance Police Public friendship . Meanwhile Traffic OC of Kalimpong Pravin Gurung said we collected 37 unit of bloods today. We arranged vehicle to bring old patient from their homes . Today blankets donated by Marwadi Yuwa Manch were distributed to old peoples from the hands ASP Kalimpong. 0 Respones to "Kalimpong Traffic police organise health and Blood donation camp"